My family name is Fédé and I have a first name which is Stanley. 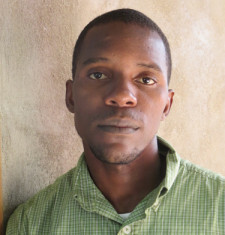 I was born on July 8, 1986 at the Hôpital de l’Université d’État d’Haïti in Port-au-Prince. I finished high school, and I have a certificate in information technology and another in diplomacy and negotiation. I speak a little bit of English. I speak French and Creole, which are my mother tongue and my father tongue. I work at Ti Kay as an oxygen technician. I have a lot of passion for this, because my dream has always been to work in a field that will let me help people who are in need and are in difficult situations. I am an honest, patient, serious, and very dynamic person. I believe in betterment. I have the concern, focus on details, and desire to attain all my goals. Nom pa mwen se FÉDÉ e mwen gen yon prenom mwen ki se Stanley. Mwen fèt 8 jiyè 1986 nan l’Hôpital de l’Université d’État d’Haïti nan Pòtoprens. Mwen fini etid klasik mwen. Mwen gen yon sètifika nan enfomatik burotik ak nan l’art de la diplomacie et de la négociation. Mwen pale yon ti kras angle, mwen pale franse epi Kreyòl ki se lang manman mwen ak papa mwen. Mwen travay nan Ti Kay kòm teknisyen nan oksijenasyon. Mwen gen anpil pasyon pou sa, paske rèv mwen se te toujou wè pou mwen ap travay nan yon domèn ki pèmèt mwen ede moun ki nan bezwen e ki nan sitiyasyon difisil. Mwen se yon moun ki onèt, pasyan, seryè e trè dinamik. Mwen kwè nan amelyorasyon. Mwen gen sousi detay e dezi pou atenn tout objektif mwen genyen.